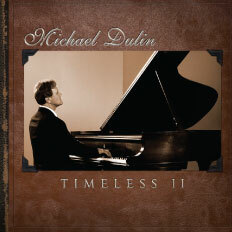 Timeless II is the anxiously awaited sequel to Michael Dulin's award-winning 2004 release, Timeless. Dulin adds his own amazing touches to eleven more of your favorite classics. His effortless and elegant virtuosity makes each song speak directly to your heart. Timeless II is filled with music that will touch your life in a rich and lasting way. Every listener will find something to love on this CD, and even classical purists will appreciate Dulin's unique arrangements as well as his elegant piano touch. If you want music that is elegant and dreamy, music that will suspend you in time and take your breath away, Timeless II is for you.